Justin Jackson carries the ball. The senior running back ran for 171 yards and a pair of touchdowns against Maryland. COLLEGE PARK, Md. — Looking down the barrel of its first 0-3 start to Big Ten play since 2013, Northwestern responded against Maryland on Saturday and put a dent in the win column amid a brutal stretch of October contests. The Wildcats (3-3, 1-2 Big Ten) shook off a slow start and overcame a pair of turnovers in a 37-21 victory over the Terrapins (3-3, 1-2). NU’s offense stole the show, recovering from a dispiriting homecoming effort against Penn State and rolling up more than 500 yards. 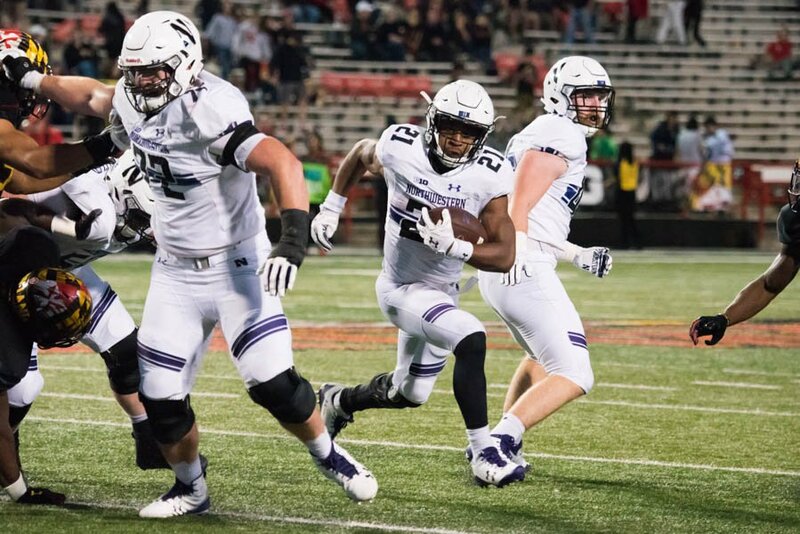 On a day of emphatic stat stuffing, senior running back Justin Jackson became the program’s all-time leading rusher, multiple receivers nabbed career highs in receptions and junior quarterback Clayton Thorson approached a career-high in pass attempts. Fitzgerald said the offensive line, which has received criticism during NU’s slow start in conference play, responded on the practice field this week and carried it into the game. The line helped shield Thorson, who was sacked just once, and paved the way for a 171-yard performance from Jackson. The Cats more than doubled their total offensive output from their 31-7 loss one week earlier. Maryland scored first, taking a 7-0 lead in the first quarter on a pass from Max Bortenschlager to D.J. Moore. Bortenschlager, the Terrapins’ third-string quarterback entering the season, has seen himself tossed into the fire due to injuries. Though he finished with three touchdown passes, NU limited the sophomore signal caller to 17 completions on 38 passes. The Cats’ defensive front also shut down the Terrapins’ often explosive rushing attack, holding the home team to 31 yards on the ground in the first half. Meanwhile, Thorson and the NU offense started to roll, posting 21 second-quarter points to take a 24-14 lead into the break. Thorson hit on three of his first nine passes with an interception mixed in, but rebounded to toss for 293 yards. The first quarter Saturday also saw Jackson make his mark on the NU history book with a four-yard run that pushed him past Damien Anderson to first in the school’s career rushing list. Jackson said he did not know he had broken the record following the rush. Maryland threatened at moments in the second half in front of a thinning announced crowd of 38,325, but never got closer than 6 points. NU largely kept the ball on the ground while running out the clock on the Terrapins in the fourth quarter. The Cats will take the victory home to Evanston with Iowa set to visit next week and No. 21 Michigan State the week after. With losses to No. 7 Wisconsin and the No. 3 Nittany Lions now in the rearview mirror, the road victory gives NU something to build on as it battles deeper into an unforgiving Big Ten slate. Correction: A previous version of this story misstated Penn State’s ranking at the time of publication. The Nittany Lions were No. 3. The Daily regrets the error.